STOP! Don’t look away if you are using different software or old systems! We have transferred many, many clients onto Xero without a problem. If you are using Sage or Quickbooks it is very simple and FREE to transfer your data and this can be completed within 24 hours. At Normans we want to turn your numbers into knowledge and to do this as quickly and efficiently as possible we must use what we believe to be the best software on the market which is Xero. We have concluded this through experience and research into all the cloud options, and we have invested time and resource to ensure our dedicated staff team are experts in the use of Xero and have the skills and experience to use this software to its full capacity. In addition to xero we have identified and use a variety of other software apps, all of which work perfectly within our systems and enable you to get your data to us with the minimum of time and effort. All the apps we recommend , we do so because they are:- easy to use, will save you time and money, they reduce the burden of filing and keeping paper records and ensure we can do our job quickly and effectively. 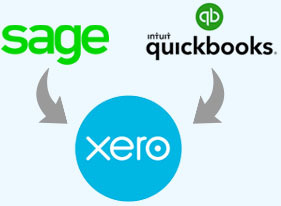 Sage and Quickbooks users – We can transfer 2 years of your Sage or Quickbooks data into Xero for free within 24 hours! How simple is that! Spreadsheet users –In many cases we can simply upload your spreadsheets directly into the software using the import functionality. If the quality of data does not allow this we can still resolve any discrepancies and upload as much information as possible manually. Bespoke software – Don’t worry, there are many ways of getting your data into Xero and we have done it with some ancient and unwieldy systems! You will be no different we assure you! And we love a challenge! 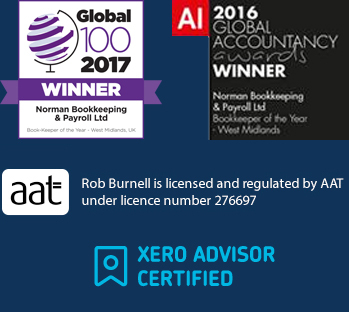 At Normans all of our staff are experts in the use of Xero and are Xero certified advisors. This means that by employing our services you really can ensure that this software is used to its optimum capability and you and your business will benefit from it. We leave you to do what you do best for your business, or to enjoy your hobbies, family and social life, whilst we do what we do best ! Its the difference between a golf club in the hands of the guy next door and a golf club in the hands of Rory Mcllroy! Access your data on the go! There are hundreds of apps that will link directly with Xero such as Stripe, GoCardless, PayPal and Shopify to name but a few. Check out the short video on what doing business using Xero can look like and how it WILL benefit your business. as you can see below. your phone (Takes 2 minutes). No more wasting paper, printing off invoices. No more carrying piles of receipts around in your wallet. It is that simple, we will make sense of it for you when it arrives into the software and we have no filing to do (Yay!). It will also put a copy of the receipt into your software putting you ahead of the game for HMRC’s Making Tax Digital regulations. payments from your Customers. It is so good that we use it ourselves, we have also helped our clients transform their cashflow by setting them up on this system. PayPal – If you use PayPal for your business transactions then we can link this to Xero for you! Stripe – A fantastic way of taking payment from your customers using credit card. Again, we can link this to Xero for you. So what is the end result of this change for you, what do you get if you employ our services which are all based on using the cloud facilities? Secure access to your latest accounts online (from anywhere in the world). Expert accountants using the best software to produce your accounts. We keep abreast of new software developments and ensure our staff maintain their expertise with refresher training. Peace of mind that your bookkeeping and accounts are all accurate and up to date, that all records and filing are electronic and secure, so no need for those paper files and to keep receipts etc. We thrive on helping businesses get on top of their bookkeeping and payroll to maintain control. Our specialist team and use of proven technologies to simplify your tasks and turn those numbers into knowledge for you and your business is what we do. Please feel free to call, fill in the form, email. However, you contact us; we are always pleased to help.